Green Equipment Options is now the Official Distributor of ClimateMaster Parts and Equipment in Northern California. ClimateMaster is a powerful partner in green heating and air conditioning, be it residential, commercial or an industrial application Green Equipment Options can equip you with the latest systems to make one green install. Visit ClimateMaster.com for details. Geothermal and Heat Pump and Ground Loop Technologies. These “Boilerless/Towerless” Heat Pump systems use the natural thermal properties of the Earth to dissipate or capture heat for the water loop. Geothermal Heat Pumps operate in an identical fashion to Water-Source Heat Pump units. However, without the need for a boiler or cooling tower, they save substantial energy costs and space. Geothermal Earth Loops come in several different configurations depending on space availability and soil properties. Chances are at some point you have either stood over, or walked across a geothermal loop field. Loop fields can be located under parking lots, landscaped areas, or any number of other locations. All earth loops use high-density polyethylene pipe to circulate either water or an antifreeze mixture. All joints and connection fittings are thermally fused to prevent leaks and most piping comes with a 25-year or longer warranty. Vertical loops utilize bore holes drilled to an average depth of 250 feet. Once the loop pipe is inserted into the bore, it is grouted using a Bentonite mixture for maximum thermal conductivity. 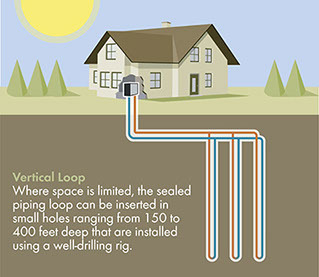 When space is a limited, vertical loops are the most common type of geothermal loop installed. 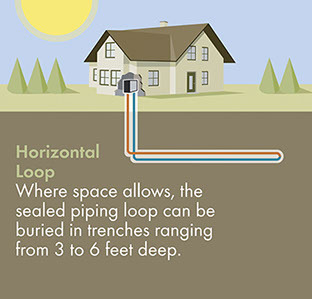 Horizontal loops utilize trenches dug to an average depth of four to six feet. As one of the more cost effective loops to install, horizontal loops are commonly found in open fields, parks or under parking lots. Lake loops utilize a “slinky” assembly of geothermal loop piping placed at the bottom of a pond, lake, or other large body of water. An extremely cost effective loop system, lake loops are an easy alternative if the option is available. Most commonly known as “Open Loop”, well systems pump water out of a nearby body of water or water well, and then discharge the water into another body of water or water well. Well systems usually employ a plate heat exchanger inside the building to keep the building water loop separated from the well water. This prevents any contaminates from affecting unit performance and extends system life. Well systems are often the most efficient as the well water is always at the same temperature year-round. incentives are available in your area. The water loop system is underground and the units are inside the building. Thus, the environmentally friendly geothermal system preserves the architectural design of a building naturally. Geothermal also saves on water usage as compared to the water cooling towers that work by evaporation of potable water. EarthLinked Technologies’ innovative, high-efficiency geothermal heat pumps provide affordable heating and cooling that enable people and small business owners to hedge against soaring electricity prices, lower their energy bills, reduce their carbon footprint and improve their quality of life. The EarthLinked Commercial Water Heating system also offers extraordinary savings to large users of hot water such as motels, multi-family dwellings, public housing, dormitories, pool heating, healthcare facilities, food processors and restaurants. Earthlinked is a geothermal process that focuses on the use of copper and refrigerant loops instead of plastic pipes and water loops. This application is sometimes preferred when the soil or depth of the geothermal system is limited. Fill out the form below for more information about Earthlinked brand geothermal.